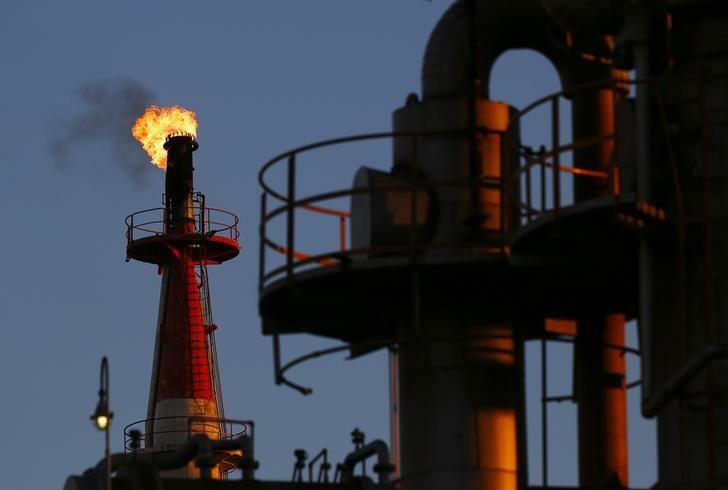 LONDON (Reuters) - Oil prices fell 3 percent on Monday as Iraq announced record-high oil production feeding into a heavily oversupplied market, wiping out much of the gains made in one of the biggest-ever daily rallies last week. Brent crude (LCOc1), the global benchmark, was down 90 cents at $31.28 a barrel by 1440 GMT (9:40 a.m. EST), losing 2.8 percent from its closing price on Friday, when Brent surged 10 percent. U.S. crude (CLc1) traded $1.07 lower at $31.12 a barrel. The losses came despite news that oil producer group OPEC was evaluating holding an extraordinary meeting. Qatar's energy minister said a request for such a gathering was being discussed. Oil prices remain near 12-year lows as global supply continues to outstrip demand. Iraq's oil ministry told Reuters on Monday oil output had reached a record high in December. Its fields in the central and southern regions produced as much as 4.13 million barrels a day, the government said. A senior Iraqi oil official said separately the country may raise output even further this year. The closing of large amounts of short positions had caused a huge rally on Friday that was largely undone again on Monday, creating huge volatility in the oil market. In a sign investors expect oil prices to rebound, data from the InterContinental Exchange showed speculators had raised their net long position in Brent crude during the week to Jan. 19. In the United States, one of OPEC's largest production rivals, a further drop in the number of oil rigs was expected to weigh on output. U.S. investment bank Goldman Sachs said it expected production to decline by 95,000 barrels per day in 2016, including well deferrals, higher than previously assumed. Analysts at Energy Aspects said global oil inventories would continue to fill in the next months, but should start to ease by mid-year. OPEC's Secretary-General Abdullah al-Badri said at an event in London that signs were already emerging that the market was rebalancing. He also said OPEC and non-OPEC producers needed to work together to tackle oversupply in order to prop up oil prices.